The 2170 JACKSON STREET cooperative apartment house features three massive arches and a pair of lanterns at its entrance. 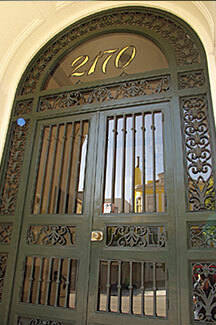 Enter the handsome LOBBY through the ornate wrought iron & glass door with transom & sidelights. The space is enhanced by a brass chandelier, large mirrored panes and glazed ceramic tile floor. The elevator opens to a private entrance dedicated to each full floor residence. The major renovation of this apartment was completed in late 2004. A list of improvements is provided at the end of this statement. The apartment is characterized by well-proportioned rooms with high ceilings, beautiful deep crown molding and recessed lighting throughout, along with dark stained hardwood floors in the public rooms and fine custom built-in cabinetry. 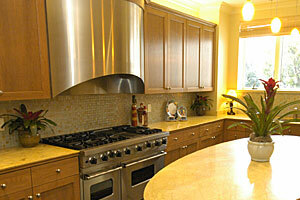 Adjoining the kitchen is the FAMILY/MEDIA ROOM with a built-in entertainment system and a 52" plasma TV screen. 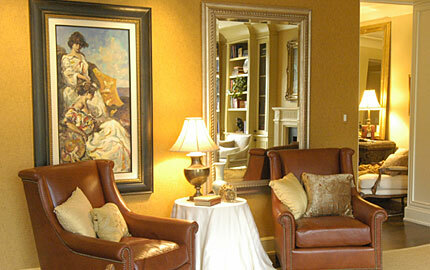 The GALLERY provides ample wall space for an art collection. A pair of French doors open to the decked light well in which potted plants are displayed. 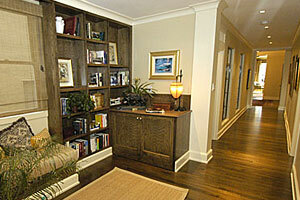 An open library alcove off the Gallery houses bookcases and a built-in bench. This space also hides the newly installed washer/dryer with convenient access from all the bedrooms. The newly designed GUEST BATH features a pedestal sink and slate tile floor. 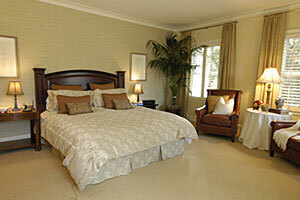 The spacious and very private MASTER SUITE is located at the far end of the Gallery. Its four picture windows overlook the charming brick patios and gardens of neighboring properties. 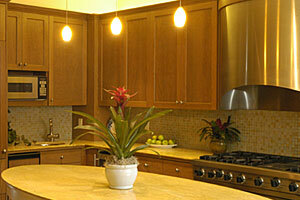 Built-in cabinetry houses a 42" plasma TV. The luxurious MASTER BATH features granite vanity with double sinks, limestone warm floor, spa tub, separate shower, sconce lighting and a 14" plasma TV. The newly designed DRESSING AREA provides generous customized wardrobe storage. Completing the floor plan are two sunny BEDROOMS with custom closets and adjoining BATHROOMS for each; one with a shower, the other with a tub. HOA DUES: $1,175.00 per month: house utilities incl. steam heat, water, scavenger, window washing, capital maintenance & repairs, insurance, etc. $21.65 per month for DirectTV + $3.99 for receiver.